Dunna Bridge is one of those places we have always passed on the way to somewhere else. There's no settlement as such, just a stone farmhouse on one side of the road, a track leading to another farm on the other, and the road intersecting it. Besides the stone house with a postbox on the wall there are footpath signs nearby that have caused me to say, 'I wonder where that leads to' more times than I care to remember. The small car park a couple of hundred yards up the hill was our starting point. We disembarked, walked parallel to the road, before following a path adjacent to the house. Then we came to a gate, a path junction and a decision. That decision was postponed by looking at a tree. 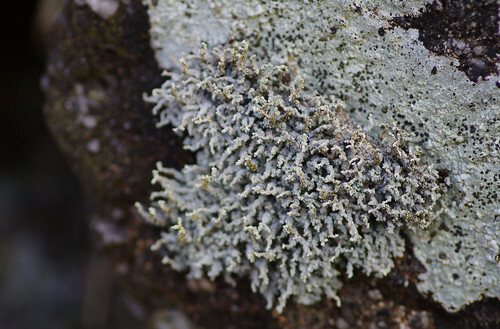 This is one of the archetypal Dartmoor lichen species. We have often seen it on our moorland walks but this grand specimen was well worth capturing. The 'sausages' were more pronounced and the size was greater than others we have seen, not merely a garland hanging from the tree but seeming to dominate it. At the gate we took the right fork path and proceeded in a leisurely fashion up the hill. Clearly, it was not going to be a day for breaking long distance records, not when every few yards offered something different to record and ponder. 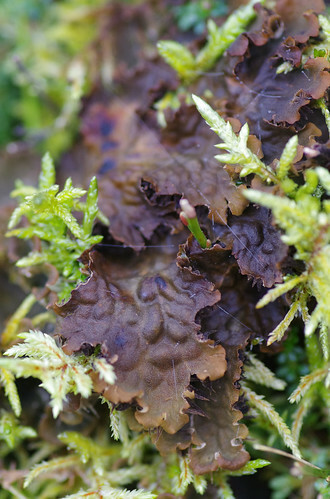 This is another common species on heaths and moors (it features in our Field Studies Council laminated leaflet) and we have been seeking it on each of our recent moorland outings. This species has distinctive whiskers (called cilia) at the end of the lobes. Over time it may develop round discs. I really like the symmetry of this shot. As well as examining the trees, we paused to look at the boulders. 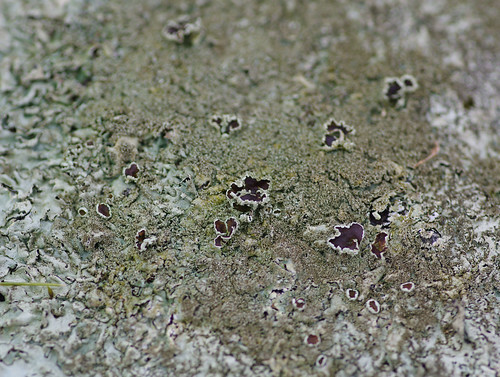 I have been hoping to see Map Lichen (Rhizocarpon geographicum). For a moment I thought I might have found one but the prothallus was relatively indistinct. Another member of the Rhizocarpon family provided the best match. 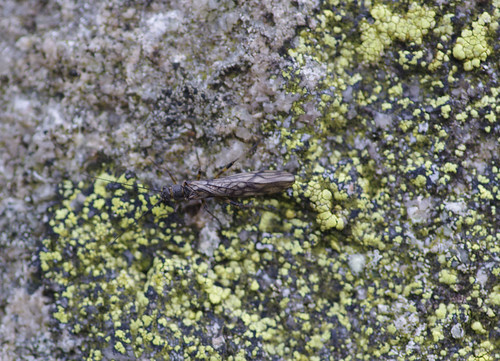 While we were concentrating on the lichen we almost missed this fly. It was a cold Saturday in February and we certainly did not expect to see something of this ilk. There have been thirty four stonefly species recorded in the UK. This is one of them. The stripy markings on the legs were striking. Most stoneflies prefer watery habitats by streams, lakes or rivers. But I'm sure we were not that close to water. This rock was adjacent to a gate. Perhaps the fly had merely veered off course. 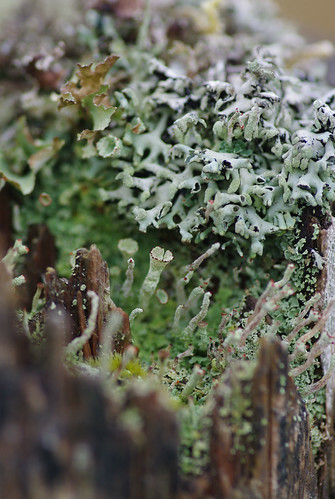 This was a wooden post with a thriving lichen community living within its borders. It was like a container for plants. There are a couple of different Cladonias in the foreground. Behind them lies a group of Hypogymnia tubulosa; their darkened cut lobes and farinose soredia at some of the lobe tips help distinguish this species from the similar Hypogymnia physodes. 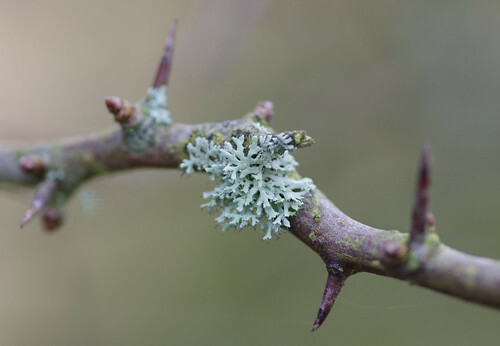 Almost every branch presented a new identification challenge. 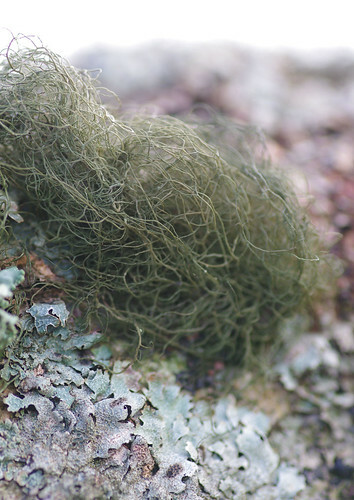 This was another new species: its thallus liberally peppered with warts known as pseudocyphellae and coarsely sorediate at the tips. Unlike the other Punctelias this species is black under the surface. For a moment we could have been down at the seashore, transfixed by corals exposed by an ultra low tide. The latter part of the Latin name refers to the grey ends of the scales. They supposedly resemble the smoking plumes from a volcano. Unfortunately, we did not get close enough to put this to the test but we will know what to do next time around. Many of the Porpidias are said to be almost inseparable. But the above specimen matches the example in the field guide too closely to be readily dismissed. 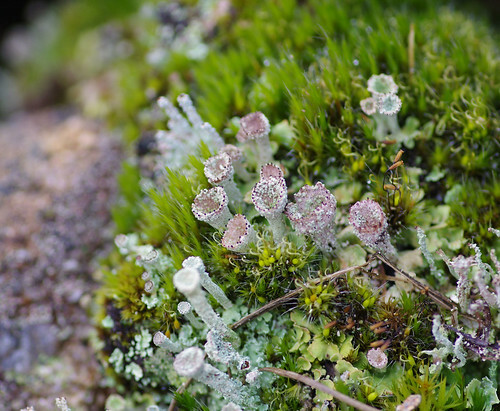 I think there are probably at least two different types of Cladonias in the image above. The size and shade of green of the basal squammules varies. 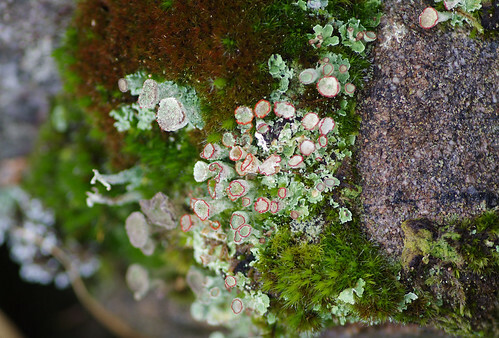 The row of pink-tinged Cladonias with green granules inside the cups could well be Cladonia pyxidata. That species has the apple-green, digitate squammules. 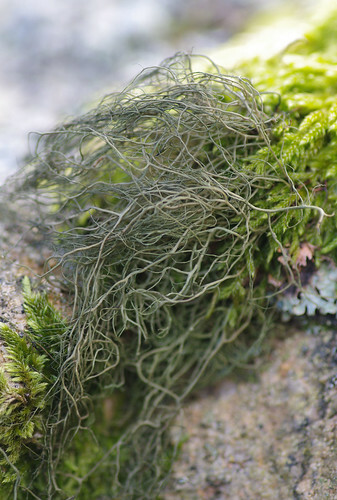 The mosses are a tangle of spiky shoots, fruits and twisted, shrivelled peristomes. Sherry took an overhead shot to highlight the unusual shapes of the cups. 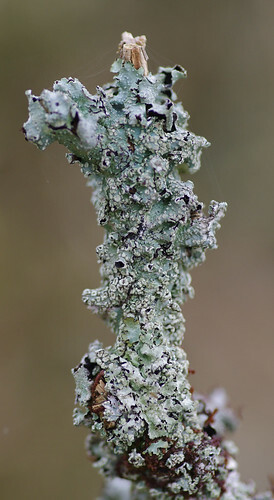 This could be an example of Cladonia diversa in its immature (pycnidial) state. When mature these cups will be replaced by red projections a bit like misshapen boxing gloves. 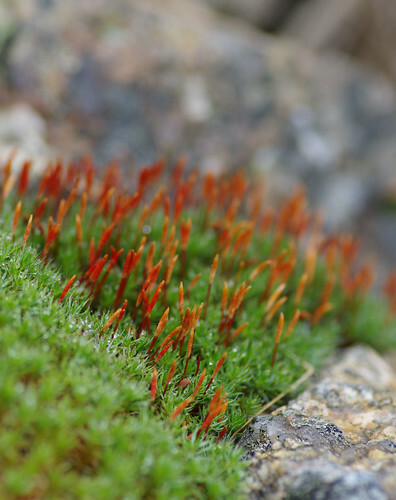 This shot was tightly cropped to emphasise the red sporophytes. 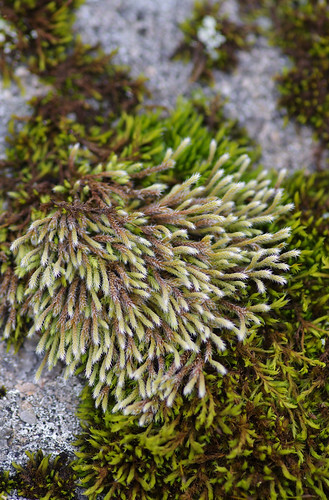 But the detail has still been retained in the hair-like points of the leaf tips. Our walk had been put on hold for a few minutes. We were ambling round a mounded collection of rocks and boulders close to a gate. 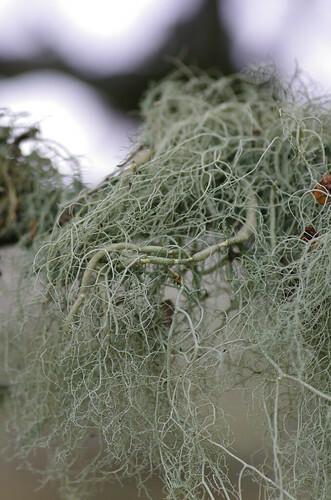 On this lichen island there was a rich tapestry of life to be captured. Different communities of some species co-existed in a close, chaotic space. Occasionally, there were stragglers and loners. Were they pioneers - the first of their kind? Or were they the last survivors? This has the feel of encountering a solitary lifeform on a distant, barren planet. 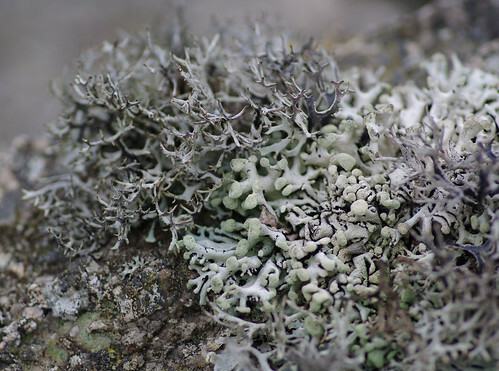 We completed our tour of lichen island and then resumed our walk. There was an area to the right of the path which was sealed off. There was no symbol on the map but it looked sufficiently intriguing to warrant further investigation. We wandered over to the site of an abandoned mine. These areas would probably have been left open years ago. 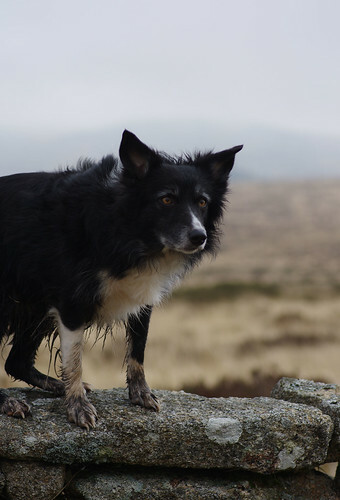 It made me wonder if there was ever anyone on the moor who had taken a wrong turn and remained unaccounted for. With these grim thoughts swimming round in my head I kept my distance from the barrier, instead turning my attention to the gorund surrounding it. We have previously encountered this species in graveyards. 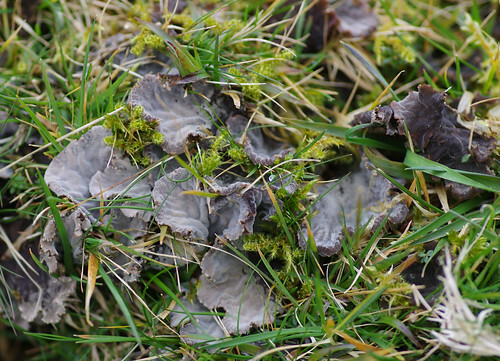 I had high hopes this might have been Dog Lichen (Peltigera canina) but a closer look revealed simple, spiky and not bushy rhizines underneath the lobes. This is the same species but has a markedly different appearance. The lobes are brown and bubbly in texture. They were growing in the same habitat, only a few feet apart but these are much wetter-looking. 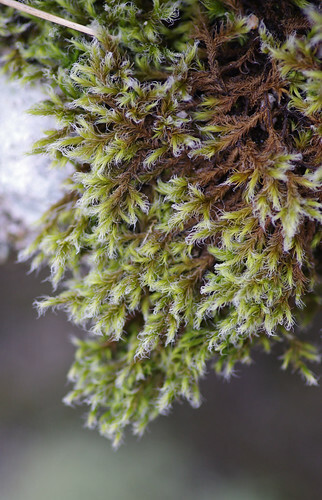 Perhaps there is a spring underneath the mossy turf or more surface water run-off than the previous felty grey example might be subjected to. From the disused mine areas we worked our way to an impressive standing stone up on our left. 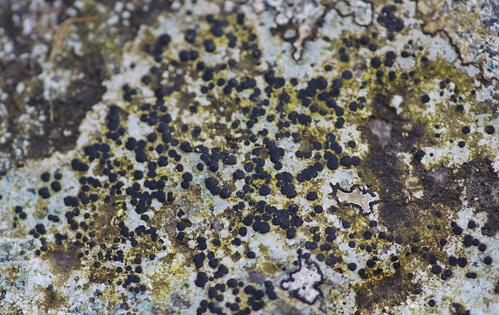 The lichens there looked as ancient as the rock itself - withered by the passage of time. Leaving the stone behind, we trudged along a path: through some deep, peaty stuff to examine what was left of a building. Going around the walls, we heard a strange, unaccountable noise. It might have been the wind whispering but it sounded more like voices. We did not dally to find out but set out on the return trail. These had strap-shaped lobes. Taken from a low angle, they seem almost monstrous, towering up to engulf some poor victim. I'm not sure how on earth Sherry achieved the unusual colour of the bokeh because there was nothing similar to that colour in the background. And when I asked her how she had pulled off the illusion she wasn't sure, either. 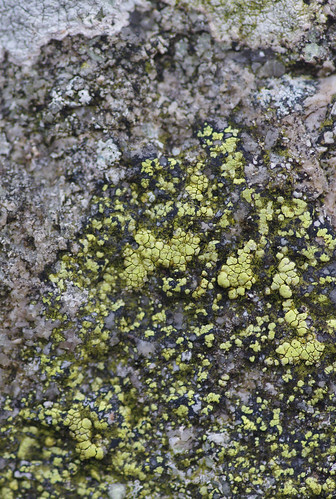 Pseudevernia furfuracea stands proud in the background with the sorediate lobes of Hypogymnia tubulosa below it. The rocks were scarcely bare, usually covered in specimens of one sort or another. Lady had been very patient and understanding thus far so it was time to reward her patience. On the way back we entertained our collie, and we were doubly entertained in return. We found sticks to use for her favourite game of 'fetch' and Sherry tried to grab some action shots of an unpredictable running dog. 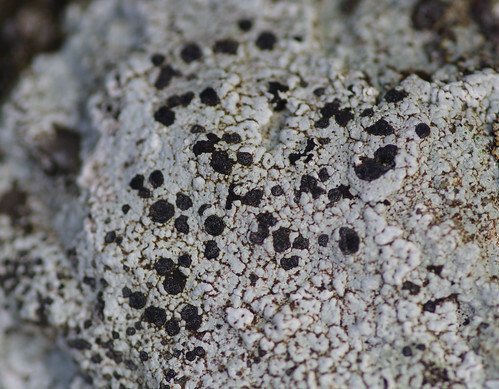 There are a couple of helpful features in the images above: a black prothallus, clustered black apothecia and evidence that some have fallen out and left slight depressions on the surface, as well as a scattered powdery and yellow substance (this might be another species, however). 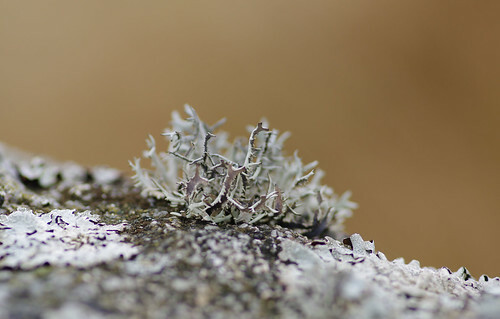 This was on top of a drystone wall just before Dunna Bridge. It was darker than any Usneas we had seen and suggested a new species. It was loosely tangled like an abandoned bird's nest, or my hair on a blustery day. Wild, in other words. Sure enough, in the comfort of home, we were able to find it with relative ease. This one gave us more difficulty. It's probably Sphaerophorus globosus, except for the fact that there are no globes present. 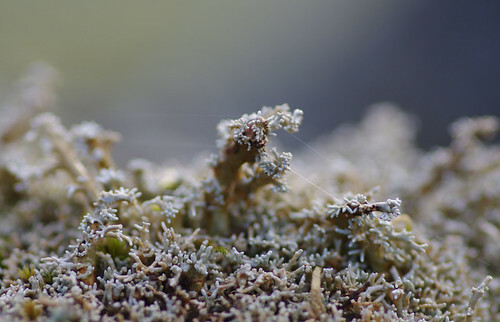 I don't think this is a lichen at all but the powdery Trentepohlia algae. 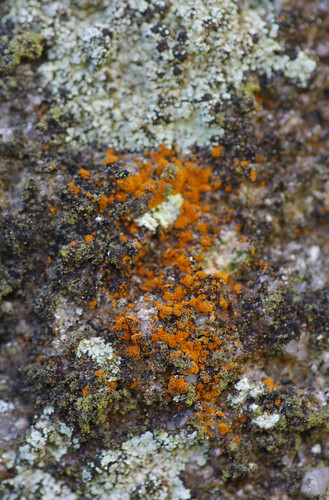 I have a hunch this might be Porpidia crustulata. 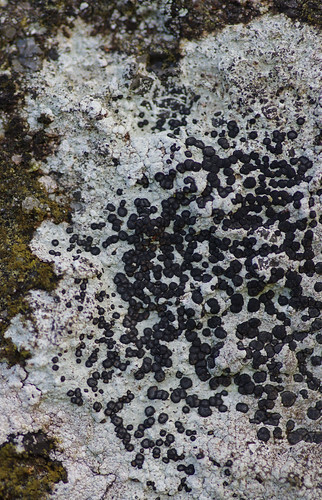 There are considerably more black apothecia than Porpidia cinereoatra. But there are also species in other families with the same, or almost identical characteristics. Soon after seeing this we left the path behind, turned right along the road and walked back towards the car park. En route there was one last new species to quicken our pulses. 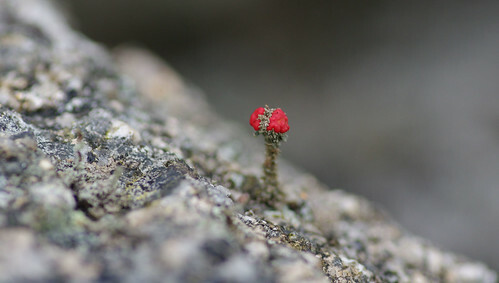 This moss was on a rock close to water. We will certainly be doing another variation of this walk at a later date. I would like to venture further out next time before having to return. As time passes and more species have been accomplished, our emphasis will shift to walking to more isolated areas in the hope of seeing something rare, or never before encountered.